I love side dishes that will go with a wide variety of main courses…especially when those side dishes involve cheese. 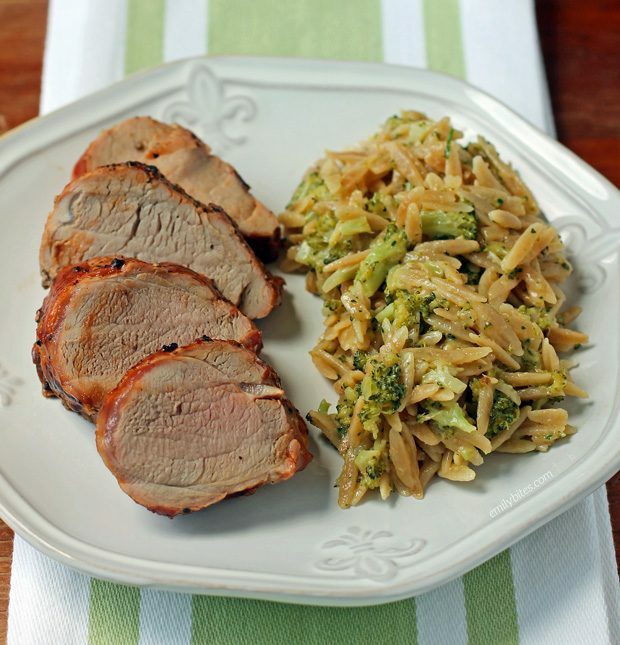 This Cheddar Broccoli Orzo will be perfectly at home on your table all year long, but I particularly love it for summer because it pairs really well with chicken, pork, steak or any other meat you want to throw on the grill (pictured here with grilled pork tenderloin). This dish also comes together quickly and easily with minimal prep (you just have to cut up the broccoli and shred the cheese) and uses ingredients I almost always have on hand. Even better, it’s creamy and cheesy pasta for just 177 calories or 5 Weight Watchers SmartPoints per serving! I based this dish off of my Spinach and Parmesan Orzo, so if you’re not I the mood for cheddar and broccoli, I’m sure you’ll love that one too! Looking for more ideas for easy and delicious side dishes? Check out my Easy Garlic Knots, Butternut Squash Quinoa Salad, Greek Orzo Pasta Salad, Cheesy Broccoli Bake, Garlic Roasted Green Beans with Almonds, Zucchini Casserole, Loaded Cauliflower Bake, Zucchini Squares, Cheesy Potluck Potatoes, Crispy Corn Fritters and many more in my side dish recipe category! In a large skillet or saute pan, bring the butter over medium high heat until melted. Add the dry orzo and stir to coat. Cook for 2-3 minutes or until some pieces of the orzo begin to brown. Add the minced garlic and stir together. Cook for an additional minute or so until garlic is fragrant. Add the broth and water to the pan and bring to a boil. Cover the pan and reduce heat to a simmer. 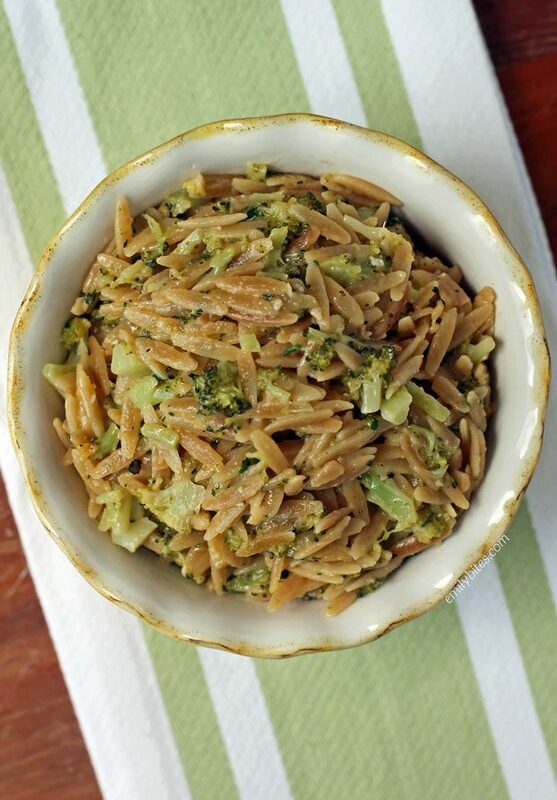 Allow to simmer for 5 minutes and then stir in the broccoli, Replace the lid and continue to simmer for an additional 8-10 minutes until the broth is absorbed and the orzo and broccoli are tender. Remove from heat and add the cheddar, mustard powder, parsley, salt and black pepper and stir together until thoroughly combined. Serve immediately. This looks delicious. I have never cooked orzo. Just made this last night….so good! I know it totally defeats the purpose of healthy eating, but I had to add more cheese! I could see adding chicken to this to make it a full meal! I’m loving all the recipes you’ve shared! I have never cooked orzo before. This was really good. Even my husband, who doesn’t like broccoli ate it!